Oh brussels sprouts, my love for you is in constant competition with my love for sweet potatoes. I can't give you my final decision today, but do know I will continue this internal battle probably until I die. All jokes aside, brussels sprouts should be a vegetable you incorporate into your diet more often. They're packed with vitamins B6, C, K, potassium and copper - all things you want in your system regularly and consistently. They also look like mini cabbages, which, to me, is adorable. My favorite thing about brussels sprouts is how easily flavored they are. Something I tell my roommate (who I've converted to actually enjoy cooking!) - and pretty much every person I know - is how you flavor your food makes all the difference. Yes, a little garlic and pinch of salt can do wonders, but there's more to use in your arsenal than those two staples. Get creative, people! However, despite talking about the need for creativity, don't force it. Sometimes the simplest ingredients can create the most delicious results - something I learned from my idol and inspiration, Anthony Bourdain. The dressing I paired with this is a simple homemade balsamic that's the perfect balance of sweet, savory, with a little bite from the vinegar and freshness from the Italian herbs. This is a dressing my family tossed all our nightly salads with and it has yet to lose its classic touch. If you also have a love for balsamic and brussels sprouts, I highly recommend trying my Balsamic Glazed Brussels Sprouts - they're easy, quick, and a good way to use up these mini cabbages before they turn! Beets are also an amazing root vegetable to regularly incorporate into your diet. They're loaded with vitamin C, iron, and magnesium. The taste and texture reminds me of an earthier, somewhat sweeter white potato but with a little more crunch. Beets can be easily seasoned and are a versatile vegetable that I highly recommend you get to know better in your own kitchen. Now on to the star ingredients: bacon and parmesan! Who doesn't love both? More importantly, who doesn't love both together? Sad, sad people. That's who. In case you didn't know, McCormick's Bacon Flavored Bits are actually vegan! These are now a staple kitchen item for me because they fulfill my bacon craving just perfectly without all the extra fat, grease, and other bad stuff I don't want to put in my body that animal bacon has. Vegan parm isn't always as easy to find and it can be a tad pricey, but it's still worth the cost because it never goes unappreciated - at least in my house. I prefer Follow Your Heart's shredded vegan parmesan but if you wan't something more cost efficient and versatile, you can sub in nutritional yeast. It has a similar cheesy flavor with some protein content and can sit on shelf for quite a long time. This recipe is chilled (because, summer - no hot foods please) but it can easily be transformed for the colder seasons. I will probably end up making this for my family Thanksgiving, adding cranberries and serving it hot to make it more seasonally appropriate. If you serve it hot, I recommend roasting the vegetables in the dressing instead of adding it on at the end. While the oven heats, shave and cube your beet, halve the brussels sprouts and mince the garlic. 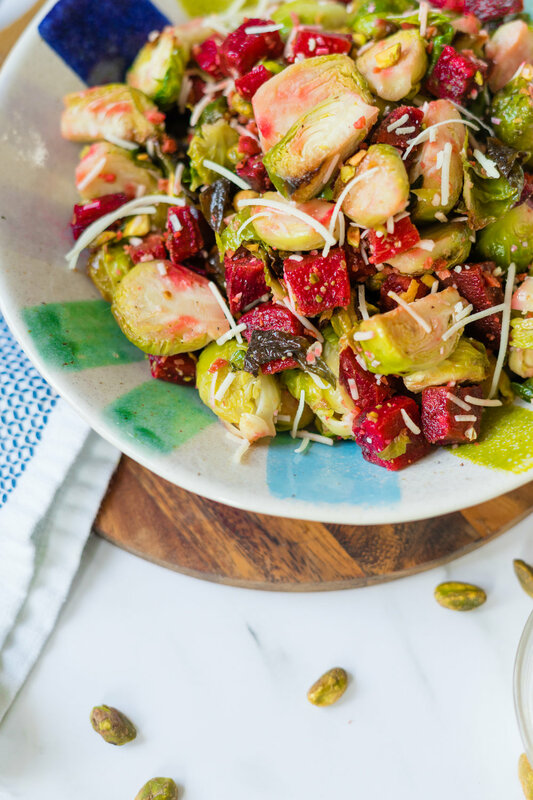 In a medium-large bowl, toss the brussels sprouts and beets in 1/4 cup and 1 tbsp avocado oil, minced garlic, pepper, and salt. On a parchment or silicon mat lined baking sheet, spread the vegetables out evenly. Place in the oven and allow to roast for 30 minutes. While the vegetables roast, cook your rice according to the package instructions. Once done cooking, remove from heat and place in a separate bowl in the fridge, allowing to cool. Roughly chop the pistachios using a larger knife. Prepare your dressing mixing all the ingredients together in a sealable jar and shaking until fully combined. Once the vegetables are finished roasting, remove from the oven and allow to cool for at least 20 minutes. 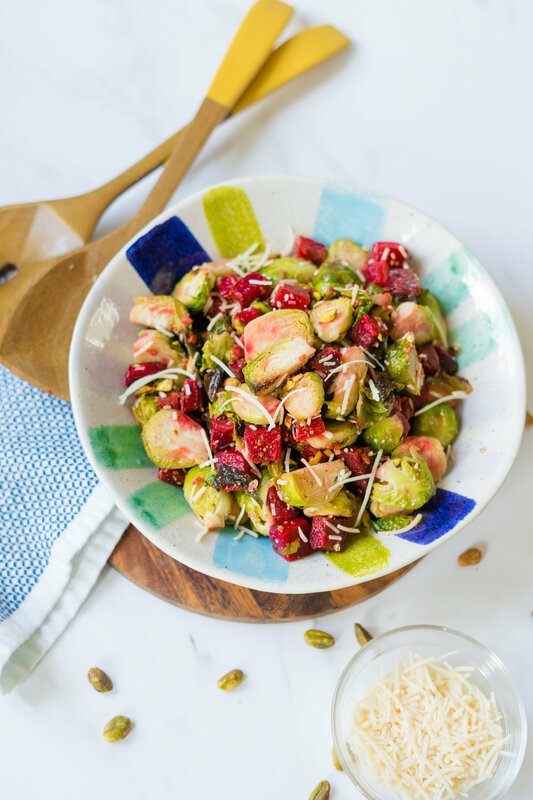 In a large bowl, combine the brussels sprouts, beet, pistachios, bacon bits, brown rice, and vegan parmesan. Toss a few times before tossing the salad in the dressing. Keep refrigerated if not completely cooled off before serving. When ready to eat, serve with extra vegan parmesan and dressing on the side.